In the world of manufacturing, the Industrial Internet of Things (IIoT) has come, and that means data. A lot of data. Smart machines, equipped with sensors, add to the large quantity of data already generated from quality systems, MES, ERP and other production systems. All this data is being gathered in different formats and at different cadences making it nearly impossible to use—or to deliver business insights. Azure has mastered ingesting and storing manufacturing data with services such as Azure IoT Hub and Azure Data Lake, and now our partner Sight Machine has solved for the other huge challenge: data variety. 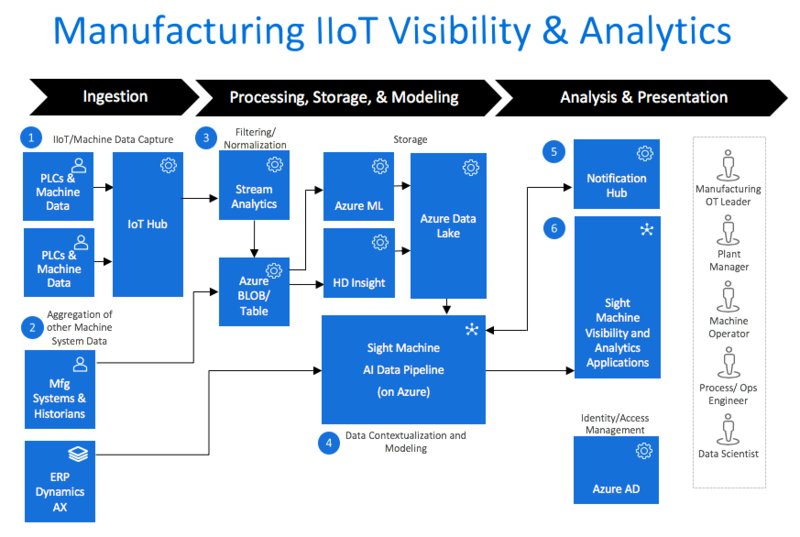 Sight Machine on Azure is a leading AI-enabled analytics platform that enables manufacturers to normalize and contextualize plant floor data in real-time. The creation of these digital twins allows them to find new insights, transform operations, and unlock new value. Manufacturers are aware of the untapped potential of production data. Global manufacturers have begun investing in on-premises solutions for capturing and storing factory floor data. But these pre-digital world methods have many disadvantages. They result in siloed data, uncontextualized data (raw machine data with no connection to actual production processes), and limited accessibility (engineers and specialists are required to access and manipulate the data). Most importantly, this data is only accessed in a reactive manner: it does not reflect real-time conditions. It can’t be used to address quality and productivity issues as they occur, or to predict conditions that might impact output. Sight Machine’s Digital Manufacturing Platform—built on Azure—harnesses artificial intelligence, machine learning and advanced analytics. It can continuously ingest and transform enormous quantities of production data into actionable insight; such as identifying vulnerabilities in quality and productivity throughout the enterprise. The approach is illustrated in this graphic. Sight Machine’s platform leverages the IoT capabilities of Azure to ingest data from machines (PLCs and machine data). Azure IoT Hub and Azure Stream Analytics process the data in real-time and store it in Azure Blob Storage. Sight Machine’s AI Data Pipeline dynamically integrates this data with other production sources. These sources can include ERP data from Dynamics AX, analyses generated by Azure’s Machine Learning Service and HDInsight stored in Azure’s Data Lake. By combining all this data, Sight Machine creates a digital twin of the entire production process. Their analytics and visualization tools leverage this digital twin to deliver real-time information to the user. Integration with Azure Active Directory ensures the right engineers can access the right data and analysis tools. Somewhat contrary to the notion of “twins,” digital twins result in one source of truth—at least in the world of data. The idea is simple: take data from disparate sources and locations—then combine the information in the cloud into digital representations of every machine, line, part, and process. Once a digital twin has been created, it can be stored, managed, analyzed, and presented. Sight Machine creates digital twins that represent every manufacturing machine, line, facility, supplier, part, batch, and process. Sight Machine’s AI Data Pipeline automates the process of blending and transforming streaming data into fundamental units of analysis, purpose-built for manufacturing. This approach combines edge compute, cloud automation, and management with AI. The benefits include classifying, mapping, data transformation, and unified data models that are configurable for every manufacturing environment. To learn more about the company, go to the Sight Machine website. To try out the service, go to the Azure Marketplace listing and click Contact me.